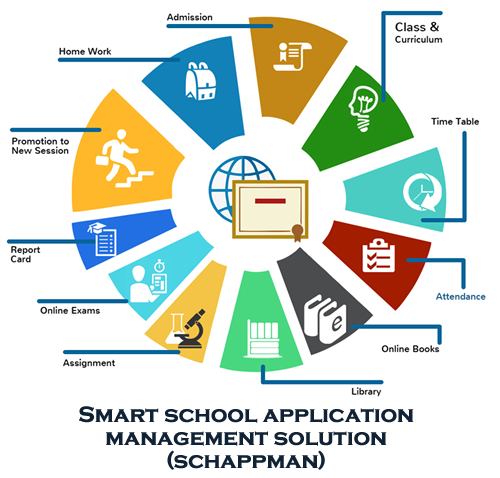 SCHAPPMAN is comprehensive computer software which allows you to store, modify and retrieve information related to school admission, information, examination, promotion, tuition management, financial accounting, Scheduling, attendance management, feedback, library management, placement, inventory, Security and other utilities. Each of the modules has sub modules within them. All these modules are integrated with the information provided from the student and the staff administration module. It provides an Interactive platform for all entities of the school like Teachers, Students, Management, Financial Department and Parents. SCHAPPMAN comprises of modules that cover each and every department of school and make the functioning of any Educational Institution effortless. The web based features of the Software enables the students as well as the management to interact actively and efficiently. Students services is enhanced by allocating user name and password whereby they can view their mark lists, attendance, syllabus, important notes and other information related to their course on the browser. GET YOUR REPORTS IN SECONDS! The application generates various reports useful to the school management, faculty or an end user of each module separately. Any specific report can be customized as per client requirement. Depending on the type of user access, provision is given on the Internet to view reports directly for student, faculty, management or general staff. Provision for Internet reports for parents/guardians to view the student status on fees, schedules, exams results, internal and external marks, attendance is provided and can be viewed on the internet.